An excellent interactive learning aid. 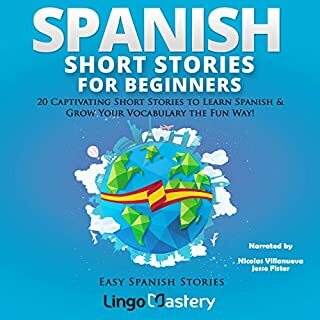 In this book we have compiled 20 easy-to-read, compelling, and fun stories that will allow you to expand your vocabulary and give you the tools to improve your grasp of the wonderful Spanish tongue. The repetition is what makes this course work. Such a great way to learn! 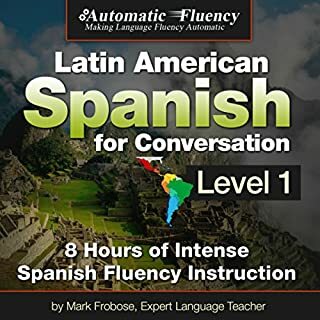 This learn intermediate Spanish bundle program will teach you how to speak authentic Latin American conversational Spanish. Using only native Spanish speakers, this program will ensure that you develop an authentic Latin American Spanish accent. This bundle covers lessons 31 to 60. 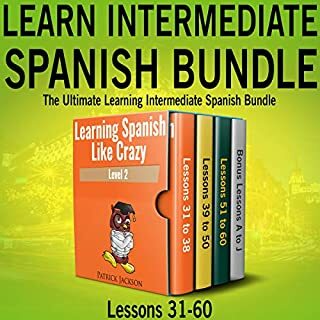 This learn Spanish intermediate bundle also puts a major emphasis on improving pronunciation. 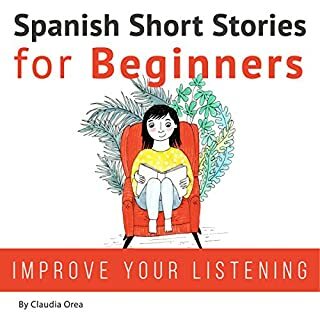 Today, I am going to show you how to take your first big step towards really becoming conversationally fluent in Spanish. All it takes is a few minutes of your time every day to actually speak and understand authentic conversational Spanish and build fluency one lesson at a time. Please remember this: None of the language programs out there that you've been using are really focusing on fluency. Even the best language programs are pattern rich, but vocabulary and memory poor. Really great to start learning! 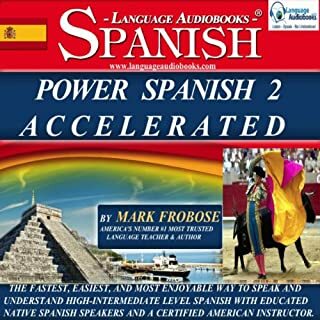 The long awaited sequel to Power Spanish I Accelerated is finally here! This exciting high-intermediate level Spanish program will teach you to speak and understand authentic Latin-American Spanish even faster and at a high-intermediate level. Learn to communicate in the past, present and future tenses, while you respond to exciting and innovate learning situations with a number of expert and educated native Spanish speakers and an English speaking guide. Learn Spanish with Paul Noble combines an exciting, new non-traditional approach to language learning with the easy, relaxed appeal of an audio-only product. No books. No rote memorisation. No chance of failure. I liked the fact that their was an explanation of why many verbs were used in the audio. The fact that Paul Noble had Native speakers from both Spain and North Americas doing the pronunciations of words so one could note the differences. It was slow enough for me to go back and listen to the words so I learned a lot and built my vocabulary at the same time. This is a wonderful, fast language introduction. 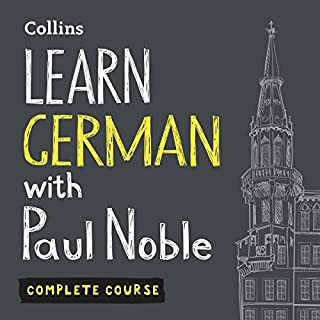 I’d recommend it for anyone trying to get some conversation skills for a trip. I love the method used for teaching. It's so simple and easy. I learned a lot without efforts and the process is really enjoyable. 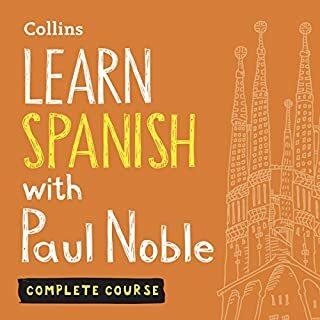 A fantastic way to learn to speak Spanish. It's very intuitive. I'll be purchasing the next level! Just not a fan of the delivery or the style of learning in this audible. so slow, I learned very little. very repetative. I would instead recommend you listen to the podcast called "light speed spanish" particularly the "light speed Spanish vocabulary" series. a MILLION time better. and free! Just didn't care for it. What would have made Collins Spanish with Paul Noble - Learn Spanish the Natural Way, Part 1 better? I don't mean to be a jerk, but trying to learn Spanish from someone with a British accent made me have to do double duty deciphering and I just didn't like that. 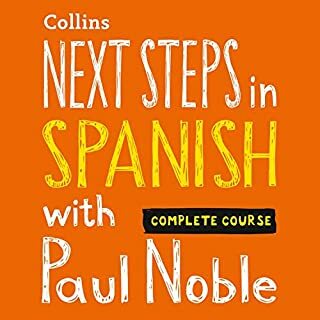 If you could play editor, what scene or scenes would you have cut from Collins Spanish with Paul Noble - Learn Spanish the Natural Way, Part 1? Boring, dry, and weird ways of saying things. I'm pretty sure this guy doesn't speak the language he's attempting to teach. The format is weird and the phrases are weird. First part spent a lit of time asking if stuff was romantic...it isn't now...it isn't now. Not so good: Difficult to revise. The tape was divided only into 4 parts making it impossible to go back a short way and revise. (as with the German one). Have to go back to the beginning of first section and listen to all the blurb. Boring. 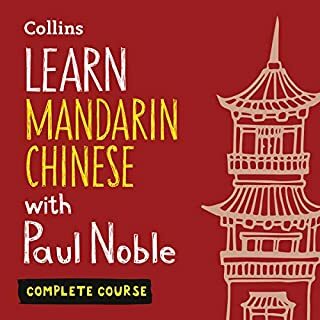 What was most disappointing about Paul Noble’s story? Dividing the whole performance into many chapters instead of just 4. The two Spanish speakers were fine with speaking Spanish as in Spain and the other South American Spanish. Clearly, Paul Noble has done a great service to those of us who need high quality Spanish instruction from a good English speaking instructor. He is gifted, intelligent, and structured. 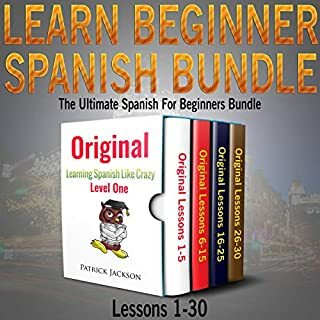 Learn Spanish the Natural Way is a must buy. However good, it is not the best out there. Many other programs like Pimsleur have a much better memory technique. 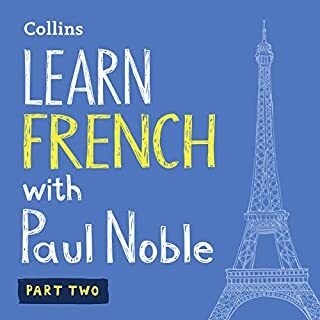 The overall best programs in any language that I have tried are by Language Audiobooks and a fellow named Mark Frobose who also created Behind the Wheel Spanish for Macmillan Audio. His best programs are the Power Spanish series in my opinion. 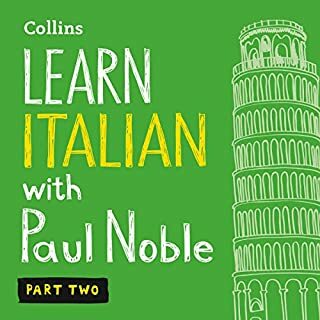 Buy Paul Noble, he is very good. 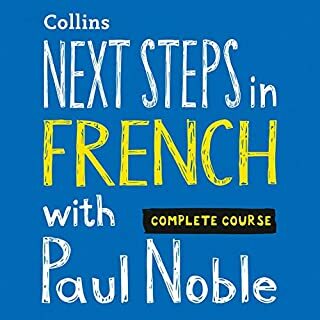 But supplement with Frobose and Pimsleur for a well-rounded approach. Have you prepared the paella? Be prepared to spend the entire first lesson learning this phrase. Not useful! Buy Pimsleur. Good start if you are traveling to Spanish speaking country. Not for everyday natural conversations. 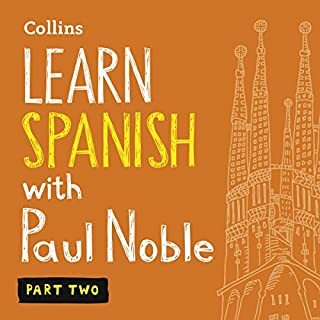 Would you consider the audio edition of Collins Spanish with Paul Noble - Learn Spanish the Natural Way, Part 1 to be better than the print version? This is part 1 which has a good chunk of material although he drones on a bit in the intro. Bought all 4 books in the series, 1-3 were good and have 3-4 hours worth of material. Part 4 shocked me when it was only 19minutes and as such was a pure rippoff.